A DAYTONA TRADITION THAT KEEPS GETTING BETTER. Located in Daytona Beach, FL The Oyster Pub has been serving tourists and locals alike for nearly 40 years. The Oyster Pub opened in 1979 and has been a Daytona staple ever since. We are located on Seabreeze Blvd., in the heart of Daytona Beach's tourist district, The Oyster Pub has been providing the best atmosphere for food and sports since our inception. We are so much more than "just an oyster bar." 70+ TV's broadcast all of todays best sports, amazing oyster selections, great burgers and pub grub, are just a few things you'll experience here. We have seating options for just about any occasion. Join us at the bar where oysters are shucked right in front of you or have a seat in our dining area with plenty of family friendly seating. Enjoy a bite outside on our patio basking in the great Florida weather. We also have a private dining area which can seat up to 100 guests for any private affairs you may wish to host. We also have an arcade room to entertain the kid in all of us. We look forward to you joining us during your next stop in the heart of the beachside in Daytona Beach. Nacho chips piled high with chili, fresh jalapeño peppers, black olives, lettuce, tomato, and sour cream. Crisp nacho chips piled high and served with our homemade salsa. Add a side of white queso cheese dip for 1.50. A pile of fresh Wisconsin cheese curds lightly breaded and fried. Served with a side of marinara for dipping. Egg rolls stuffed with chicken, cheese, corn, and black beans and served with an avocado ranch dipping sauce. 6 coconut crusted fried shrimp served with a mango poppyseed dipping sauce. A heaping basket full of thin sliced onions breaded and fried and served with a Texas petal sauce. Hand breaded shrimp and jalapeño peppers fried and tossed in the Pub's homemade firecracker sauce. Fresh smoked fish dip served on grilled crostini and topped with toasted sunflower seeds. Freshly breaded in house calamari tubes and tentacles served with marinara sauce. A classic take on the most famous chowder on the East Coast. Homemade from scratch, hearty and delicious. Mixed greens topped with turkey, ham, egg, tomato, cheese, onion, bell pepper and black olives. Crisp Romaine lettuce tossed with parmesan cheese, toasty croutons and a creamy Caesar dressing. Served with lemon, cocktail sauce, horseradish, and crackers. Available in 1/2 dozen and by the dozen. Served with lemon, butter, cocktail sauce, horseradish, and crackers. Available in 1/2 dozen and by the dozen. Grilled on an open flame, smothered with The Oyster Pub's secret sauce. Available in 1/2 dozen and by the dozen. 1/2 dozen oysters lightly steamed and topped with The Oyster Pub's homemade Rockefeller sauce. 1/2 dozen oysters lightly steamed and topped with bacon and melted Monterey Jack Cheese. 1/2 dozen raw oysters topped with fresh jalapeño peppers and cilantro with a squeeze of lime juice. 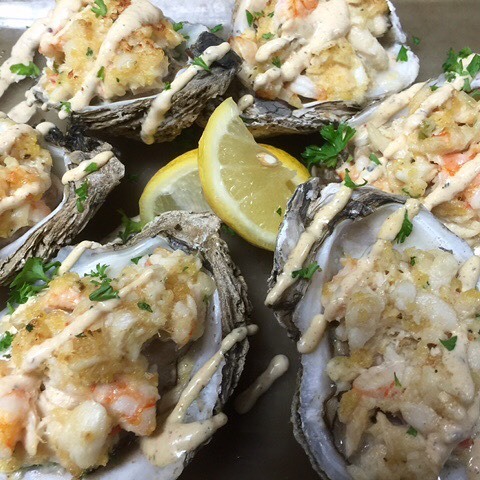 1/2 dozen lightly steamed oysters topped with a baked crabmeat and shrimp stuffing. Served raw or steamed with lemon, butter, cocktail sauce, and crackers. Available in 1/2 dozen and by the dozen. We bread these shrimp to order and fry them fresh. Freshly breaded shrimp fried and dipped in the Pub's very own buffalo wing sauce and served with bleu cheese dressing. 1 1/2 lbs. of snow crab clusters served with corn on the cob and red potatoes. 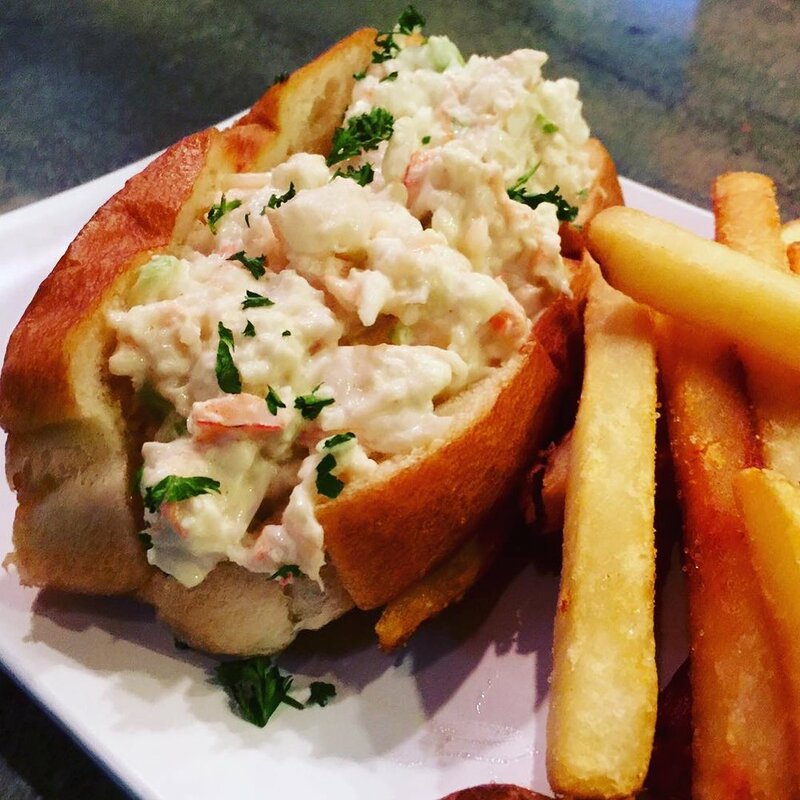 All sandwiches served with choice of French Fries, potato chips, cole slaw, potato salad, or vegetable medley. 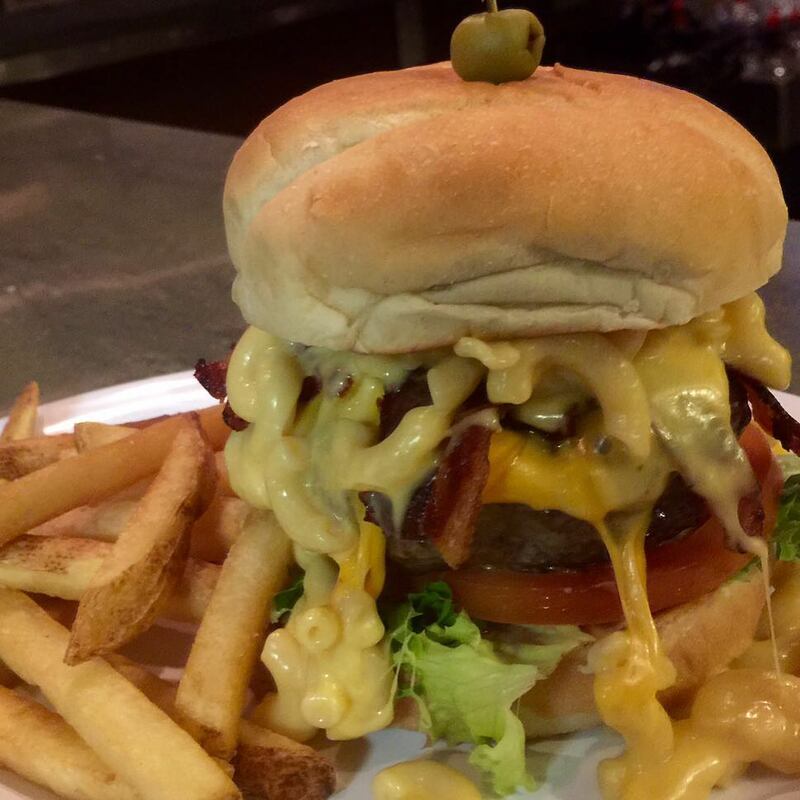 An 8oz hand packed burger made from the finest fresh ground chuck and steak trimmings around to make this the juiciest and best tasting burger in town. Grilled chicken breast basted in teriyaki glaze and topped with grilled pineapple. 6oz. N.Y. strip steak cooked to your liking, chopped and mixed with melted American cheese, mushrooms, and onions. Fresh ground chuck sloppy Joe and melted American cheese served between two pieces of grilled jalapeño corn bread. Served with sweet potato fries. Philly steak meat sandwich topped with melted provolone, bell pepper, onion, and mushroom. An American favorite. Applewood smoked bacon, lettuce, tomato, and mayo served on your choice of bread. Stacks of turkey, bacon, lettuce, tomato, and mayo toasted and served on your bread of choice. House smoked corned beef, Swiss cheese, sauerkraut and thousand island dressing on grilled rye bread. Your choice of grilled or blackened mahi mahi, served with choice of lettuce, tomato, and onions. White flaky, Atlantic Haddock fried and served on a bun. 1/2 pound all beef hot dog served with your choice of toppings. One dozen freshly breaded shrimp fried and served with French Fries, hush puppies, and cole slaw. Served grilled, fried or blackened with rice, hush puppies and cole slaw. 3 soft tacos of fried mahi mahi topped with cabbage, tomato, and jalapeño cream sauce. Served with rice and salsa. Served grilled or blackened with rice, hush puppies and cole slaw. Grilled teriyaki marinated chicken breast topped with teriyaki glaze and grilled pineapple and served with rice and a vegetable medley. Fresh breaded shrimp and jalapeños fried and tossed in the Pub's homemade firecracker sauce served in flour tortillas with shredded vegetables and topped with green onion. 8oz fresh salmon filet pan seared and topped with a Kentucky bourbon glaze and served with rice and vegetable medley. House smoked full rack of baby back ribs served with French fries and a cole slaw garnish. 12 oz. 31 day wet aged N.Y. Strip grilled on an open flame and served with choice of side. Fried chicken tenders served with french fries and choice of dipping sauce.